Dhoni remained unbeaten on 20 as India romped home with seven wickets in hand. MS Dhoni isn’t a technically perfect batsman. But he has managed to defy the odds and score a plethora of runs in his illustrious career. Dhoni is a street-smart cricketer and puts a price on his wicket despite the fact that his batting capabilities are on wane these days. He struggles while facing the spinners but doesn’t easily give up. The same was visible at the Eden Park in Auckland on Friday during the second T20I between New Zealand and India. The incident happened in the 16th over of the chase when Ish Sodhi was bowling. Dhoni was on the strike even as India were on course for a victory to level the series and the Kiwis were desperately in need of a wicket to make a comeback. Sensing an opportunity to go big, the veteran batsman came down the track only for Sodhi to throw the ball wide outside of the off-stump. Within a split second, MS Dhoni realised that he won’t be reaching the pitch of the ball to churn out some runs and concentrated on returning back to the crease with his back leg. He was completely bluffed by the leggie as Dhoni also tried to bring his bat inside the crease. However, while bringing back bat in the crease, the ball smacked the willow to go towards point. There was no fielder there and Dhoni ran for a quick single. This was one hilarious shot as even his bottom hand came off the bat in the process. What left the fans in splits was the way the experienced campaigner tried to come back to the crease to avoid a stumping dismissal. 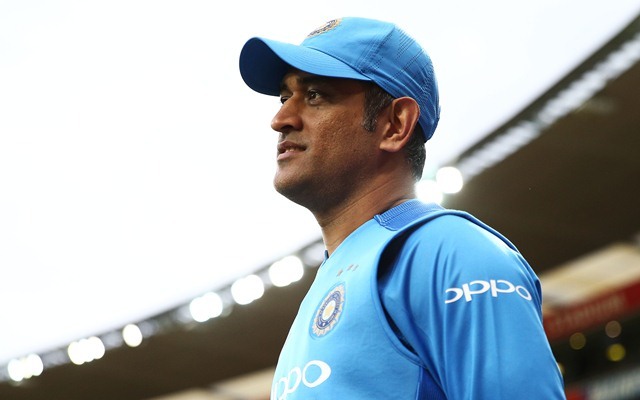 Eventually, with his pyrotechnics, MS Dhoni was successful in saving his wicket and was also unbeaten until the end in the chase for the umpteenth time in his career. He remained unbeaten on 20 off 17 balls as India cruised to victory with seven balls and as many wickets to spare.